The phenomena of complex gasdynamic heating exist in the hypersonic interaction region, such as the interaction region of body and wing of hypersonic aircraft. The main mechanism is the interaction of three-dimensional shock waves and boundary layer. 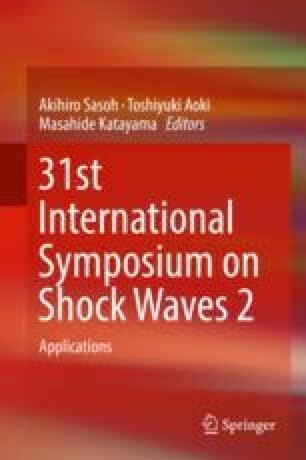 This paper explored the role of three-dimensional (3D) shock wave interaction in the complex hypersonic heating based on the theory of 3D shock/shock interaction (SSI). The results show that complex 3D SSI configuration exists in the hypersonic interaction regions in different flight conditions, both regular interaction and irregular interaction. The contact surface induced by the 3D SSI represents the flow jet inclines to the boundary layer of aircraft surface, which always causes the high local heating flux. In the flight condition with a certain attack angle, complex 3D Mach interaction of shock waves in the interaction region of body/wing exists, which induces the complex flow around the wing; the jet bounded by two contact surfaces inclines to the surface of wing and causes the local heating peak, similar to the IV-type heating mechanism in two-dimensional interaction of shock wave and boundary layer.